Hall's Mundus Alter et Idem (Another World, and Yet the Same), is a forerunner of Gulliver's Travels. Written when he was a student at Cambridge, it, "is the first known example of a satirical atlas that was moralistic." (Reitinger 2007, 440). The work is "an allegory of man's voyage through life," in which a, "scholarly but innocent Englishman" is persuaded to take a voyage of discovery to an unknown continent, "only to find himself abandoned there in a world of moral failings." (Fausett 1993, 44). Among the areas mapped are Lavernia (the land of thieves), Pamphagonia (the land of gluttons), Moronia (the land of fools), Ivronia (the land of drunkards), and Viraginia (the land of nagging women). See also Baynton-Williams 2015, 34. The circulation of Hall's work in England was "considerably inhibited by his Puritan enemies," and late in life he was detained in the Tower and expelled from his leadership role in the Anglican Church (Reitinger 440-41). In contrast, Mundus Alter et Idem "became something of a classic in continental Europe, with at least four editions by 1664." (Fausett 51). The first edition of the Mundus Alter et Idem was apparently published in London in 1605, with a smaller map, 16 x 19. 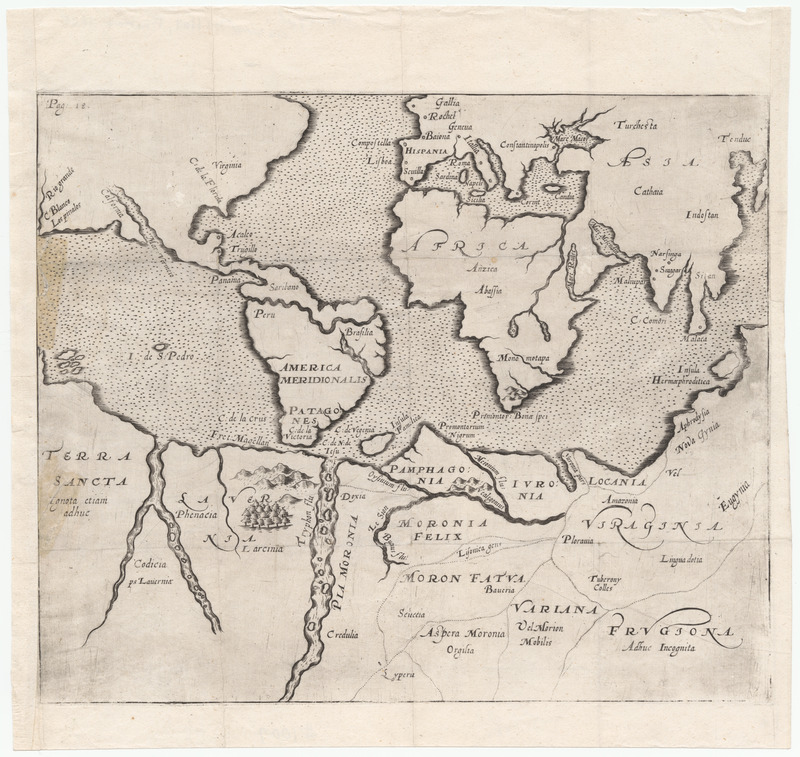 This copy of the map appears to be from the edition published in Hannover in 1607. See Shirley # 251. For the maps of Gulliver's Travels, see ID ##1024.01-.05. Hall, Joseph, Mundus Alter et Idem, Hannover 1607.